Not a great deal to report this week, few bits and pieces happening behind the scenes will update you all more when things progress a little more but we've got big plans for the AGPC, and a clear vision to work towards. 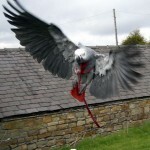 Really enjoying this beautiful weather, so are all our greys as they get more "out in the aviary" time, it's never fun being stuck indoors looking out at the cold miserable weather in the winter time, so lets hope it continues on into the year, it's been a while since we had a full decent summer. Pointless babbling on too much more as I am sure you are all itching to get your teeth into the rest of the newsletter so off you go. Well, here we are again ... I swear these fortnightly newsletters come around quicker than the weekly ones did! There has been the usual fund raising activities going on, on the forum, the treasure map still has squares to fill, still prizes left. 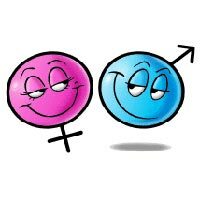 We have also been toying with the idea of some sort of Lottery syndicate but can't quite work out how to do it, so if you have any suggestions, post it in the fund raising threads and we'll try and sort something out. A lot of new members have joined in the High Five Fund....that's really great, thank you very much. I can't wait until all the jars are emptied to see how much we have all raised. Easyfundraising has been going really well, thank you so very much to everybody that shops online through that link. In case you didn't know there is an easy one to get 25p for the fund, just go to Easyfundraising and scroll down to the raise funds for free.....click on Argos and enter the draw for £10,000 it doesn't cost you anything at all but raises 25p for the fund. Oh and if you win the £10,000 it says in the T&C that I am to have half hahaha. As some of you are aware, I do quite a bit of photography, I have sold a few things in the past, but I don't really do much in the way of marketing my stuff. I have decided though, that if anybody wants to buy any of my photos, or my Photoshop work, then I will sell them for £5 each. money to the fund. They will be emailed to you in the huge orginal size, you can then take them on a memory stick, or cd, whatever and get them printed ... or of course you could get them printed online, I can't print them for you, my printer isn't up to the standard that real printer's printers are ... does that make sense? So, for example, if you wanted to buy one of the photos that I have put on the site, I'd send it to you without the frame around it, so that you could frame it yourself if you wanted to. If you have any particular things that you would like, just let me know and I'll see what I can do. Just don't ask for a pink spotted horse in a field of blue grass ... that's soooo yesterday! hahaha. Well it's newsletter time again, so what's been happening on the AGPC forum lately? Firstly the Parrots have been picking up some weird and wonderful noises, Nico is crying like a baby and shouting James in Liz's voice (poor James), Charlie is doing Pat's horrible friends laugh, Gary is saying Potato (easily impressed in Barnsley) and best not mention what Buku and Charlie and Chester are doing. 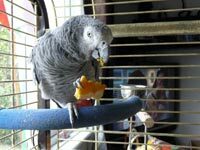 We have a major stop smoking campaign going and all the Parrots are eagerly fiddling with their tangle toys, Traff is already down to ten a day. Thanks to Chris and Julie for kick starting this, don't mention Steve though as that's a sore point. Geoffrey caused a bit of controversy this week by showing his hairy legs and backside on the forum, we had photos of a spider too. We had a visit from Captain Jack Sparrow, which particularly pleased Pat (private question to Pat, yes it's red but what is it?). Paula had a visit from the worlds worst homing pigeon, and if you felt your ears burning this was because Mandi and Pinky got together for a massive bitching session (although they would call it chatting). We have a couple of birds on the forum laying this week, Chesta and Tim, Dave is particularly pleased as this makes Fester extremely affectionate. And to end we have seen some great photos of Flint this week, We love your training ideas Lesley, especially the positive reinforcement method of shoving his head down the toilet. 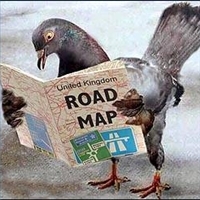 Anyone Know Anything About Pigeons?? Thursday's The Day For The Op!